Home Staging: Can it Help You Sell Your Home? When you move house, using self storage can be advantageous, not just for securely storing your belongings during or after the move, but also in the months leading up to your sale if you opt for home staging. Home staging may be a term you’re unfamiliar with, but if you’ve been brought up on a diet of interior design shows, you will understand the concept. Or perhaps you are aware of it, but can’t see the point of styling your home for sale? If presentation is how we judge candidates at interviews, book covers in shops and food in a restaurant, why do we mistakenly believe that people are not swayed by a stylish living room? Home stagers enable you to display your home in a way that makes it more attractive to viewers, enticing them to make an offer. It’s not simply a case of cleanliness and good taste luring people in. Home staging, also referred to as property styling involves using props and furniture items to create this illusion. After the initial preparations of cleaning your house, decluttering and fixing instances of wear and tear, a staging expert will help you organise your home furnishings to make the property appear more spacious and attractive. The idea is to remove personal effects and establish a canvas. Home staging is not cheap, so it’s hard for sellers to justify spending money sprucing the place up for someone else to reap the benefit. However, Right Move conducted a survey that revealed you can increase your selling price by 8% if you style your home ahead of putting it on the market. Pricing models can be an agreed amount depending on the number of rooms that need dressing. Other experts may ask for a percentage of your sale. A neutral pair of eyes can help you depersonalise your home in a way that may be difficult for you to see. Yes you can, and people are opting to do this. If you choose to go over your walls in Magnolia before a house move, then you have already experienced home staging at a simpler level. Style your home for the person you want to sell to, not yourself. Think of all the senses – Coffee smells and fresh bread are appetising and homely. Try not to burn your toast on the morning of the viewing, however. Think outside the house – Don’t forget to clean the outside of your house, refreshing the paint and weeding the driveway. Think Storage – A storage unit from Self Store & more will keep your belongings safe and secure until you move into your new home. With locations covering Monmouth, Ross-on-Wye, Lydney and the surrounding areas, we have a range of storage sizes to suit your needs. To save you time, money and effort, we can even collect direct from your door using our Mobile Self Storage Service (www.selfstoreandmore.co.uk/mobile-self-storage). It’s coming to that time of year when our thoughts turn to Christmas with so much to organise; booking your food shop, baking, planning travel, de-cluttering house for friends and family, decorating the tree, writing Christmas cards and buying/ordering all of the presents are just some of the things we try to achieve before the 25 December. Although it can bring great joy, it can also place a huge strain on your time and energy so here’s how Self Store & More can help. With friends and family visiting, it can be quite a challenge to find the space needed to host them for the day or few days if they are staying over for the festive period. However long they stay there are normally a host of bags and belongings that come with them. Whether it’s finding somewhere for them to sit or getting their things put away, your rooms become overcrowded. That problem could be solved if you declutter a week before Christmas and use a self-storage unit to create space in the short term. You might also have a spare room in the house where you normally store your extra Christmas goods until they are required on the day. However, this same space may be used all year round to store things that you’ve ‘tidied up’ or bought but only use from time to time. It would be wise to de-clutter in the build up to Christmas and use a small self storage unit to help create some much needed space. Once the festive season is over, we can either bring your things back to the house or keep them in the unit as part of your overall New Year clean out. It’s quite a challenge hiding Christmas presents from your loved ones, especially over excited little ones who simply cannot wait to see what they are getting. The most popular choices of hiding places; on top of the wardrobe, under the bed or in the boot of the car really aren’t that hard to find! Where does one hide a trampoline? How do you wrap a bicycle so it’s not obvious? If you have large or numerous items with no ideal space to store them then why not rent a storage unit for a week or two so the surprise stays just that. You can even arrange to build and wrap the items in our clean, dry warehouse unit ready for the big day if needed. Whether it’s short term Christmas related storage or long term domestic or business storage, we at Self Store & More are here to listen, advise and help you find the right storage unit for the right price for as long as you need it so please do not hesitate to contact us on 01981 541180 for latest prices and availability. Autumn is here so now is the time to start thinking about protecting your summer belongings from the winter weather. Having seasonal items taking up room in your house can leave you and your living space a little cramped, particularly during the winter months when most of your living is done inside. Customers who use seasonal self-storage free up valuable space for those winter essentials when the garden shed, attic or garage is already full. Creating space in your home by using a secure self storage facility can be a stress saver throughout the winter months but, before you do, why not follow these simple steps. How to determine what summer items to store. Will I use this item in Autumn or Winter? Have I actually used this item this summer or is it time to sell? After all, why pay to store something you never use (unless it’s a heirloom or something a family member will need in the near future). For an item you may need when the weather begins to get better, but don’t have room for at home, set it at the front of your storage unit for easy access. Extra room – No one likes clutter in their home – especially when it extends to the spare room, garages and outdoor areas. Having family stay over the holiday periods (yes, Christmas!) means space at home is of a premium. Why struggle to accommodate when a quick and easy declutter can take away some of the stress. Clean, dry Storage – Storing items in garden sheds, garages or under tarpaulin during the winter months can affect the condition of your belongings over time. With no warm sunshine to help dry them out, water, mould and mildew can wreak havoc on your belongings during the rainy season. Secure – Storing your belongings in the garden shed, garage or under cover may give you the space you need inside your home but are they secure? A professional self storage company will have numerous security measures in place such as on-site security, CCTV, fire and intruder alarm systems with 24/7 monitoring to provide the best protection and peace of mind you and your belongings deserve. If you need any help or advice with your self storage requirements then please don’t hesitate to contact us 7 days a week to suit your needs. Now the days are longer and the weather is warmer many of us will start to think about improving our home ready for the summer. For some, this can be an exciting time but, for others, the thought of DIY can seem daunting. 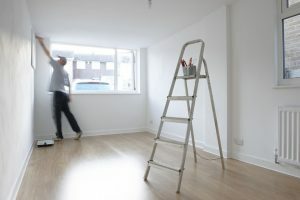 If completed correctly, it is a great way of improving your home whilst saving money on professionals so here are some tips before starting. Know what you’re getting into – Before starting your DIY project, brush up on the work needed and educate yourself by reading a DIY how-to site on-line, watching a demonstration video or even asking a friend who has relevant experience. Having motivation is essential to see the project through, but you really need to know how to do the job first. Budgeting for your project – keep some budget aside for unforeseen costs – even a professional will have a contingency for each project. Having to stop your project before it’s finished due to lack of funds can be avoided if you budget correctly and keep a list of all the materials and their costs as you go along. Know what you CANNOT do – Some things, such as working with gas and most new electrical work, are covered by regulations which prohibit the ordinary DIY’er from carrying out the work even in their own home The regulations are there for safety sake so don’t try to do these jobs, not only is it against the law but you can endanger yourself and your family. Stay safe at all times – Make sure to always read safety instructions on all products and tools, and use protective clothing when necessary. Protective clothing such as goggles and gloves won’t cost you much and will be of use for years to come. Start small – To avoid disappointment, possible damage and possible expense of getting a professional to finish it off, make your first DIY project a simple job and get bolder as you gain experience. Although knocking down a wall may look simple enough, more experience DIY veterans and professionals will know to look for possible complications such as what the wall supports, water pipes, electricity cables and other issues. Always test – For many DIY projects, particularly for complicated ones always test your skills and materials on a small scale first. This will allow you to try out your tools, ensure you have all the necessary materials and avoid causing any damage. For example, if you decided to re-coat your hardwood floor after several years of use, testing your method first on a small surface area is what most retailers recommend. Allow enough time and don’t rush the job – When starting your DIY project, the chances are you will discover that whatever it is, it takes longer than you thought. Because there’s nothing worse than ending up with half a job done, make sure you allow enough time to complete the work and allow some extra time for complications. Some projects seem to require one weekend, but in reality one weekend could eventually spread across a few. Protect your prized possessions – this is where a local self storage company can help. There is nothing worse than trying to carry out DIY whilst constantly bumping into the furniture that has been left stacked up in the middle of the room. There are not many homes that can accommodate two rooms in one and still be habitable so, by clearing out the bulky furniture you will ultimately save lots of undue stress and effort. At Self Store & More, we have small, medium and large storage solutions to suit your needs so why not contact us to find out how we can help you. Finally and most importantly – Enjoy your project so you look forward to the next one. How to safely store your winter clothes this summer. How Self Store & More can help create that much needed extra space in your wardrobe. Are your wardrobes bulging with so many clothes you can’t always find what you’re looking for? Do you you seem to only wear half of what’s in there in any given season? Are you returning home from university over summer but don’t fancy taking all of your things? If this is the case, you should consider putting some of your winter clothes (or belongings) in storage during the summer months and vice versa. Sound like a good idea? Here’s everything you need to know about packing clothes for storage! If you follow these six steps your clothing will still look as good as new when you take it out again. Here’s how to store clothes in storage the right way! The first step in packing clothes for storage is to wash them. Carefully inspect each item looking for stains and dirt and make sure they’re removed before storing your clothes.If you pack dirty clothes, chances are any stains or odours on the items will settle in over time and you might never be able to get them out! What’s more, dirty clothes are also more likely to attract insects and other vermin. This step might seem surprising as there is a lot of hype about storing clothes in vacuum sealed bags as it is a great space saver. However, the truth is, vacuum sealing is only good for your clothes if you’re storing it for a few weeks, not months.If you’re putting your clothes in storage for a couple of months the lack of air inside a vacuum bag can cause the fibres in your clothes to compress, ruining their shape and fit. The best way to pack your clothes for long term storage is in a plastic container with a clip-on lid. These will protect your clothes from moisture, dust, mould and mildew. For extra protection you can line the inside of the container with a clean cotton sheet. When considering how to store clothes in storage, you might be tempted to add mothballs to your storage container, but, as you know, they smell horrible and can be potentially dangerous if found by children or pets. A better option is to use natural cedar balls. Wooden cedar balls are long lasting, have a pleasant smell and will protect your clothes against pests! When storing your clothes, a clean, cool, dark and dry storage unit is always best. The easiest way to ensure your storage unit meets all of these requirements is to go with a professional storage company. The facilities they are able to provide are far superior to a damp garage or garden shed when it comes to keeping your clothing safe. 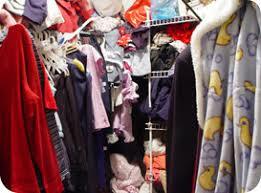 If you are planning to leave clothes in storage for long periods of time – if you are storing baby clothes until you have another child, for example – you should check on the status of your storage boxes every six months or so.This will enable you to detect any potential issues and prevent your clothes from getting ruined. Ready to store your clothes? Now that you know all about packing clothes for storage all that’s left to do is to find a suitable, convenient self storage unit. Contact us at Self Store & More 7 days a week to find out how we can help. We’ll even come and collect direct from your door to save you time, money and effort. Spring is here – Is it time to declutter your clothing storage? Winter is over so it’s a great time to declutter your clothing storage and make more room by putting your bulky winter items away for next year. It may not be a one-day job, or even a one-person job, but imagine how much better you will feel looking at your immaculate wardrobe every day and on no occasion wasting time finding your favourite outfit. Remove everything out of storage and cupboards. It’s easier to start with a clean canvas and you’ll see how much storage space you’ve got in your wardrobe. Sort through each piece of clothing. Ask yourself, do you wear it anymore? Does it make you feel good? Is it just wasting space? Neatly, fold all your loved items and put them back in their rightful place. If you are unsure about a piece of clothing, make another pile – you can always come back to it. Take any of your partners, your kids or your winter warmers like coats or thick knitted cardigans that you won’t need anymore and store them in a suitcase, sturdy boxes or vacuum-packed bags for safe keeping until next winter. You can always keep a few cardigan’s handy just in case you need an outer layer before Summer arrives. Wash or dry clean your items before storing away as any dirt or stains can cause long term damage to your clothes. Go through that “unsure” pile again and if you are sure it can be of no further use to you or someone else then simply dispose of it. If you however believe it could be of further benefit then start a donation box. Nothing will feel better than donating perfectly wearable clothes to others in need. You won’t feel like you’ve wasted your money if it’s going to someone who will get lots of wear out of it. Every item needs a designated storage space. Organisation will help your time management. Keep your work clothes in one space and your t-shirts in another. Hang up your dresses or shirts because no one likes to iron. Keep your shoes together and while you’re there, sort through and let go of any worn out, unwearable pairs. If you’re lucky and have walk in or built in clothing storage, have one side for your partners clothes and one side for yours for extra organisation. If you are decluttering your own clothes, you may as well help your partner or your kids (or both!!) while you’re at it. If your partner is unenthused about decluttering get him or her to sit down and answer a simple “yes or no” game. Hold up each shirt, blouse or pair of jeans in front of him or her and make quick decisions. As for kids, how many toys do they really need? Have they grown out of anything? Keep a few of your favourite items for sentimental reasons and donate the rest. If you don’t want to part with anything, store it all for when you have grandkids! Yes, it’s hard, but stay focused – the more you procrastinate, the more time it will take to achieve your goal and you’ll end up living in more mess than when you started. Make it a family joint effort or if you are working solo, grab a glass or mug of your favourite drink and pop on your favourite music! Take a step back and admire your decluttered clothing storage space. If you want to declutter clothing (or any other belongings) but don’t wish to throw items away, contact us 7 days a week at Self Store & More to find out how we can help provide stress free storage for as long as you need.